Preheat oven to 450°F. Butter a 9 x 13-inch glass baking dish. in a large Dutch oven or heavy pot, saute bacon until crisp. Remove bacon with slotted spoon and reserve. Saute onion in bacon drippings until soft. Add 5 tablespoons of butter to the onion mixture, stir until butter is melted. Whisk in flour and stir constantly until well blended with fat, making a roux. Whisk in mustard. Gradually add milk and cream, whisking constantly. Add salt. Simmer for 15 minutes, stirring frequently. Strain hot milk mixture into a large bowl and discard solids. Working quickly, mix in 1 cup fontina, blue cheese, American cheese, ½ cup Gruyere, ½ cup Cheddar, ½ cup Parmesan and reserved bacon. Continue stirring until all cheeses are melted. Add cooked macaroni to mixture and stir until well coated. 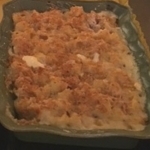 Spoon macaroni mixture into baking dish. Combine remaining cheeses and Panko crumbs. Sprinkle on top of macaroni mixture. Bake for 15 to 20 minutes. Tip: Reserve some pasta water to thin out the cheese sauce, if needed, before incorporating the macaroni.